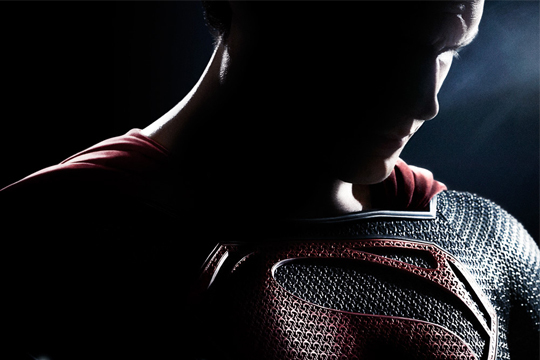 The official trailer for Zack Snyder’s Man of Steel hit the web today and it looks epic. The trailer gives you a great idea of the scope of the film in terms of its action sequences, but you can also tell that this movie will be heavily focused on who Clark is as a character, and what his path to becoming Superman entails. Here is my official breakdown of the newest trailer, including early theories on what some of the scenes represent. 0:23-0:25 – Flashback scene showing a cup full of pencils and someone writing (in cursive!). 0:36-0:38 – We fade out of young Clark’s face and back to Clark’s face underwater. VO from young Clark says, “I see it.” Older Clark opens his eyes underwater. 0:39-0:40 – Water gently lapping against a stone. 0:44-0:46 – Water filling the bus as kids scream, trying to escape. 0:57-1:00 – Fast forward several years to older Clark, beard and all, watching a small school bus drive by. 1:06-1:07 – Clark wandering around what is likely the Fortress of Solitude. 1:08-1:10 – Clark says, “I have so many questions.” He is likely saying this to some holographic image of his father, Jor-El, played by Russell Crowe. Remember that in the original Superman movie with Christopher Reeves, Clark visited the Fortress of Solitude and spoke with his father, played by the late, great Marlon Brando. 1:11-1:12 – Clark: “Where do I come from?” He is holding some small object with the ‘S’ insignia on it. 1:13-1:18 – We see Clark, now Superman, wearing the infamous red boots and red cape walking out in the snow, his cape flapping in the wind. 1:26-1:30 – Jonathan Kent VO: “Whoever that man is…” We see a shot of Superman’s back as he looks out over the Arctic landscape. We fade in on his face as he looks up at the sun and closes his eyes. 1:31-1:38 – Jonathan Kent VO: “Is going to change the world.” We see Superman’s right fist on the ground as he rests on one knee. The ground starts shaking, stones bouncing around him, pressure building. (Reader jasvll rightfully pointed out that the new musical cue that begins here is Storm from Elizabeth: The Golden Age). 1:39-1:42 – Superman rockets off the ground and into the sky. 1:43-1:44 – We see Superman flying in space, the earth above him. 1:47 – Giant explosion, looks like Metropolis exploding. If you look real close you can see someone in the debris. 1:48 – Fade in on Jor-El and his wife/Superman’s mom Lara Lor-Van (played by Ayelet Zurer). Jor-El looks at her as she gently kisses the head of their infant son. 1:49 – Shot of a bearded Clark emerging from a fire, shirtless and unscathed. (My wife always thought Henry Cavill was hot so this confirms it). This scene likely ties in with these set photos. 1:50 – An explosion in space among what appears to be a ship. This may be the scene where the ship carrying infant Clark is trying to escape from Krypton before it is destroyed. 1:51 – An outside shot of the Kent Farm with a spaceship—likely Clark’s—hovering behind a tree. 1:52 – Shot of Michael Shannon as General Zod. 1:54 – Two people running as a building collapses behind them. The man on the left looks to be Laurence Fishburne, who will be playing Perry White in the film. White, of course, is the Editor-in-Chief of the Daily Planet newspaper where Clark works as a journalist. 1:55 – A woman watching an explosion in front of them. Perhaps Superman’s mom. This may be another scene showing Krypton’s imminent destruction. 1:58 – Shot of a lake at either dawn or dusk. A man in a boat casts a fishing net as a bright object falls from the sky. I’m going to guess this is actually the scene where Zod comes to Earth. Remember, Superman lands in Kansas as a baby, so the chances of there being mountains and a lake there are next to none. 1:59 – Quick shot of Superman being marched down a hallway in handcuffs accompanied by soldiers. This is the shot from the latest Man of Steel movie poster. We fade in on a bearded, shirtless Clark screaming as he attempts to lift something while a fire roars behind him. Again, this likely takes place on the fishing boat. 2:00 – Superman flies down the side of a building and collides with someone, likely Zod or one of his soldiers. 2:01 – A giant spaceship emerges from an explosion. Based on what the spaceship looked like in the Kent Farm scene (at the 1:51 point of the trailer) it is likely another shot of Clark’s ship leaving Krypton. 2:02 – Christopher Meloni’s character, Colonel Hardy, and another man with glasses look up at something in the sky. It is clearly a bright object since Meloni’s character looks to be shielding his eyes. 2:03-2:04 – Jonathan Kent kisses the head of a young Clark. We then fade in on an older Clark holding a young girl as a tornado rages in the background—we are in Kansas after all. 2:05-2:09 – Clark VO starts: “My father believed, that if the world found out who I really was, they’d reject me.” We see a series of shots, beginning with a picture in an album of a young Clark at a science fair with Jonathan Kent. We see Superman standing in the doorway of the Kent Farm hugging his mother. We then cut to a quick shot of (presumably) Superman flying alongside a beam of light towards a bright portal. This could very well be a scene involving the Phantom Zone. We get a close up shot of Superman’s suit, and then cut to Superman crashing through a door and into a giant safe. 2:10-2:14 – Clark’s VO continues: “He was convinced that the world wasn’t ready.” We see a wide-angle shot of soldiers in hummers on a runway in what looks to be the desert. All eyes—and guns—are aimed towards the end of the runway where Superman is standing with Lois Lane (played by Amy Adams). We cut to Superman looking at Lois and then the two grabbing hands. Thanks, Andre! This film looks great. The trailer reminded me a lot of Gladiator. What was the name of the song that sounded like country, mixed with Mumford and Sons playing when the bully first harassed little boy superman on the bus? It started when he first stole clothes from the car near the house by the en of the ocean.